People pay large amounts of money for weird stuff. 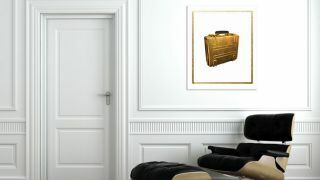 Which is why this $2,500 (about £1,537, AU$2,756) gold art print of a Battlefield 4 battlepack - a collaboration from Dice and art dealers Cook and Becker - shouldn't surprise anyone. The print is "hand-embellished and gilded using actual 24 carat gold leaf and gold paint" plus ships with a gold colored metal frame. It's an interesting tie-in to the gold packs in B4, which hold the best and rarest loot - but still, that's a lot of dough for something you can't even use in the game. These blips are gold and always free.